Chatbots are an asset to more than customer support sector. Thanks to the recent advancements in AI, chatbot use cases have greatly expanded. Bots can and have been facilitating the sales sector by collecting user data, qualifying leads and much more. In this article, we will demonstrate the benefits of AI in each stage of the sales funnel or should we say chatbot funnel. A chatbot is a software that is designed to simulate a conversation with human users. With machine learning and Natural language processing the formerly rudimentary interactions with a bot has become more advanced. At times users may not realize that they aren’t speaking with a human. According to the Salesforce State of Conversational Marketing report, they found that people from all 195 countries are using online chat to start conversations on business websites. Similarly, Gartner forecasts that by 2020, over 85% of customer interactions will be handled without a human. The sales funnel is a road map of the buyer’s journey. This process begins the moment a lead reaches a company’s landing page and ends when the lead makes the decision to buy the product or service. 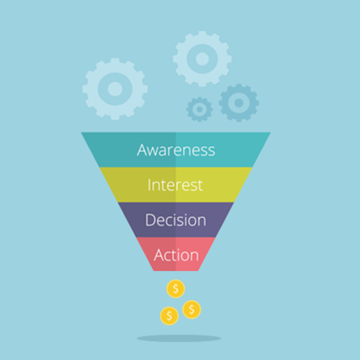 The sales funnel consists of four phases- Awareness, interest, decision, and action. 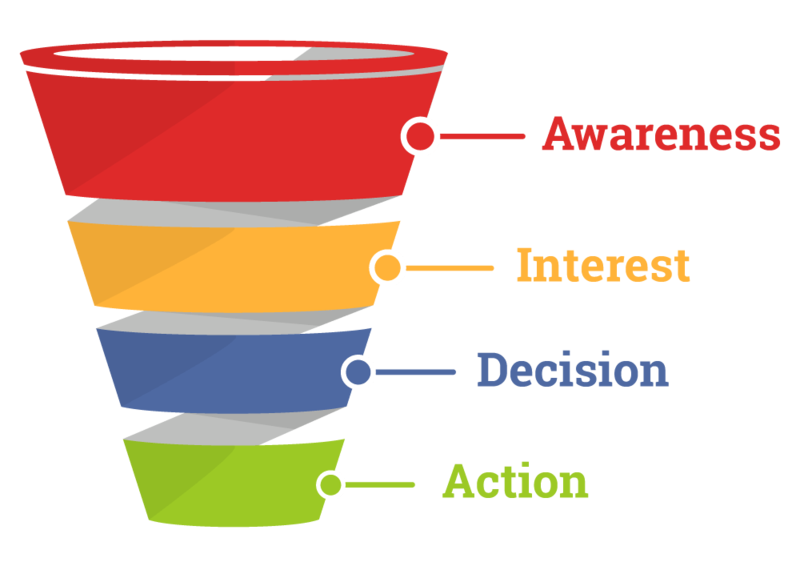 These stages are simple in theory but getting potential clients from the beginning of the funnel to reach the end, is no easy feat. With some assistance from AI the process can be optimized for success. Awareness is the beginning stage in a sales funnel when the lead first encounters the product or service. When the customer learns that the product or service exists the sales funnel process begins. Potential clients can become aware through a variety of channels such as; Facebook and various social media sites, email, television, advertisement or a bot. These platforms then drive consumers to the product landing page. This may seem like a minor advantage but building a relationship is the key to moving leads through the sales funnel. Bots can be programmed to wait a certain period of time before engaging with the visitor and the interaction can be customized depending on which page they are on, what they have been searching for and more. This can be easily done with behavior configuration. The next stage in the funnel begins once the potential lead begins to pursue additional information, and shows interest in the offered product and or service. For this stage, Chatbots exist to inform the lead, answer Frequently asked questions and a variety of other requests immediately. If the bot is unable to provide an answer the lead will then be connected to a live representative. 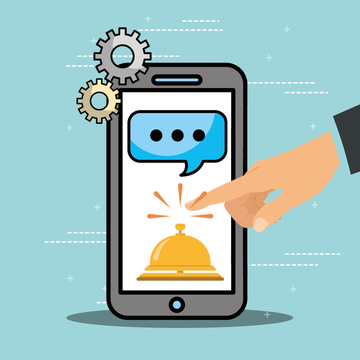 Communicating with the bot through the website provides quick answers and does not require much of the customers time, as opposed to a phone call or drafting an email. A delay of information can affect a leads decision to buy. With customer analytics, bots have the ability to suggest alternative products or services based on their previously visited pages and the customer’s needs. Chatbots can have hundreds or thousands of conversations simultaneously, 24 hours a day with no additional effort or cost. The lead takes a further step down the funnel once the decision to buy is made. Bots can send additional advertisements and information based on past conversations to the lead. Generating leads is a pivotal step in the sales process, but can be difficult and time-consuming. Bots collect valuable data on consumer behavior which helps the live team to target the consumer in a way that will lead them to the last stage in the sales funnel. The sales team then has a pre-formulated pool of qualified leads all at the decision stage. Using AI to qualify leads saves company time and resources while converting leads into revenue. The final stage in the funnel occurs when the customer makes the purchase. At this stage, a live agent typically takes over to handle the sale to completion. But more recently bots have successfully completed this process as well. This is particularly true for e-commerce and travel chatbots. The sale may be complete but the ultimate goal is to get leads to return for future business. The previously collected data by the bot is vital for internal insights and to bring customers back to the product or service. A chatbot can send scheduled follow-ups based on the stored data. This information can then be used in retargeting the user, creating a repeat and loyal customer. The data stored from consumer purchases and behavior can be used to improve the company’s products. No longer do businesses have to rely on collecting data through consumer surveys. Because a chatbot collects information through natural conversation, user clicks and page visits. A bot that is programmed for sales can segment consumers based on behavior and analytics. The bot then can apply specific scripts and campaigns based on the user. With this collected data, bots may know what the user wants and or needs before they do. This variety is optimal for moving individuals down the sales funnel. From lead generation to building client relationships, answering FAQ’s, and qualifying leads chatbots have proven to be an asset to each stage of the sales funnel. Incorporate a chatbot into a company’s sales process and reap the benefits of automated generation, while providing immediate and 24/7 customer support. Companies in any field and or industry can benefit from chatbots to master the sales funnel and improve their bottom lines. Stop sending emails and relying on old data and build your own chatbot or get into a platform. Interested in building a bot but don’t have any coding experience? Book a demo with us and lets talk about your bot project.